Preface; "Against the Gods"; Operations and operational controls; An introduction to operations and operational risk; Role of operations in managing risk; Developing controls; Mapping risk; Measuring risk and the effect of controls; Procedures; Industry initiatives; The future; Appendices. 'Controls, Procedures and Risk' covers the skills and procedures needed to enable the monitoring and managing of risk and the authors focus on procedures design, implementation and documentation. Considerable emphasis is also given to the key controls and the importance of control functions, audit and risk management groups and policy. Case studies are used to effectively demonstrate 'success' and 'failure'. In the financial services industry risk is a constant threat to organizations of all sizes and to the markets themselves. Many industry 'events' have shown how dangerous it is when a business operates in an uncontrolled way, particularly when the lack of control was not evident to the management of the business until it was too late. Controls, procedures and risk are occupying more and more management time. The responsibility to manage the risks lies with the whole operations team. If it is successful in fulfilling this role the overall risk of the business is reduced, if it is not successful the consequences may be severe. In this book the author has deliberately focussed on the practical side of risk, controls and procedures, rather than analyse the Basel Capital Accord and the capital requirements etc. (however, the Accord and updates are contained in the Appendices). Operations teams need to be aware of risk but not overwhelmed by it. 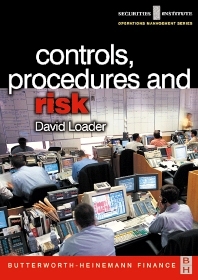 Risk management within, and by, the operations function is the focus of this book. From day-to-day risk to wider risk implications the operations function is reviewed to show the sources and implications of risk situations. The definitive series of professional references for those finance professionals concerned with "Back office" or operations management unique to this industry.Presents concise references on the essential management functions such as technology, client services, and risk management for financial operations management professionals.A comprehensive resource from a leading financial management consultant for global banks and institutions. Operations staff in banks and other financial institutions who have experience in the finance industry; Individuals who seek a career move into the operational side of the business, or those who wish to move into a supervisory/management role with the operations function. David Loader is co-founder of DSC Portfolios Ltd., which specializes in global training and consultancy services for the financial industry. David has worked in the debt, equity, and derivatives markets, and his expertise in back-office dynamics is unparalleled. He has written widely on operations management, derivatives, fund administration, and operational risk. Director of DSC Portfolio Ltd. and Loader Associates Ltd.